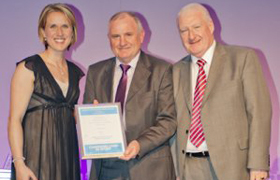 The Greater Manchester Sports Awards took place on Friday 11th November 2011 at The Point, Lancashire County Cricket Club. Katharine Merry, former world 400m number one and an Olympic bronze medallist at Sydney 2000 was guest of honour and presented the trophies. Katharine is now a mentor to junior athletes as well as working in radio and TV, and as a trackside presenter at major events. Each nominee had already won their borough awards and were hoping to become Greater Manchester winner in their category. Unfortunately Forrest Badminton Club lost out this time in the Club of The Year category to Charlestown Netball Club from Salford. However Hazel Johnson from Bolton Lads and Girls Badminton Club was successful in her category. 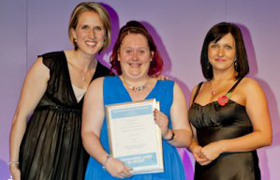 Hazel won the Greater Manchester award for Disabled Sports Achiever of the Year. Congratulations Hazel!